To enter the contest for your chance to win, please click on the photos or this contest link. 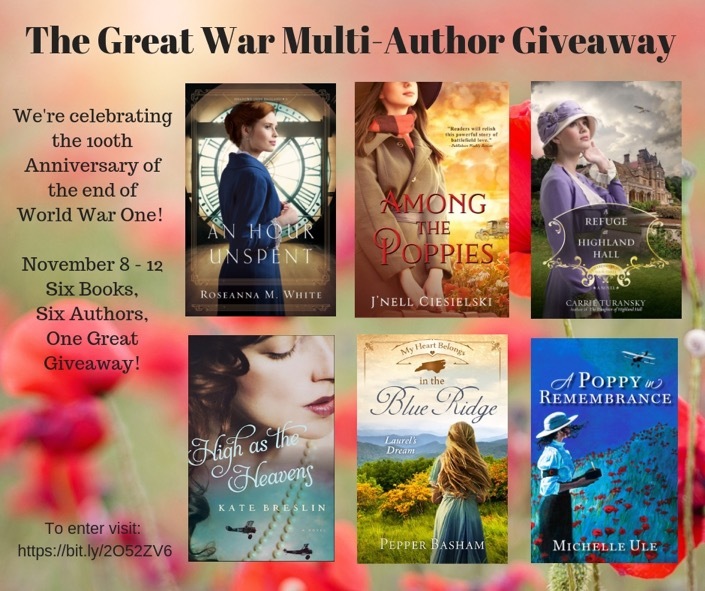 Good luck and I hope you enjoy discovering these authors and their stories! High as the Heavens is on “must read” list. I would love to win this set! Stella, thank you! I hope you get the chance to read Eve and Simon’s story! What an awesome opportunity! Thank you, ladies! Thank you for your encouragement and support, Susanne! You’re welcome, Melissa! Good luck! My pleasure, Geofree! Thank you for your support! Thanks, Nancy! We appreciate your participation! I have read these authors!!! Great books!!! Thanx for the giveaway!!!! Thank you, Jennifer! Good luck with the contest! I have only read Kate’s book, “As High As the Heavens” and I loved it! I have also read several of her other books. They bring me to a time my parents lived through (my father was transferred from the army-his peers were sent to Leyte where many died-to the Coast Guard Academy) which helps me know some of what they experienced. Thank you, Kate. Karen, thank you for your kind words, and I’m happy to know that my stories have offered you more insight into your own family history. Blessings to you! Great giveaway!! I have read books by Kate Breslin, Carrie Turansky, and Roseanna M. White. Thanks, Amanda! I hope you’ll get to enjoy all of these stories one day! I’ve read Roseanna White’s A Song Unheard (book 2 in the Shadows Over England series) and passed it along to a view in an assisted living facility. We both enjoyed it. You’re so welcome, Elizabeth! Roseanna is a wonderful author! I hope you’ll enjoy the other novels as well! Thank you for this opportunity! All of these books sound amazing! Our pleasure, Emily! And thank you for participating! Thank you, Patti! I hope you’ll get to enjoy the stories written by these new to you authors! I love this era! Thanks for the chance! Agreed, Amanda! WWI is a fascinating time period. Good luck! We appreciate our readers, Nancy! Thank you! Would love to read all these books. Love these authors. Thanks for the chance to win. Thank you, Faith! Good luck with the contest! What a great idea in honor of Veterans Day! I’ve read one of Carrie’s and one of yours, Kate! Love this era, and look forward to reading more!! Bless you, Nicole! 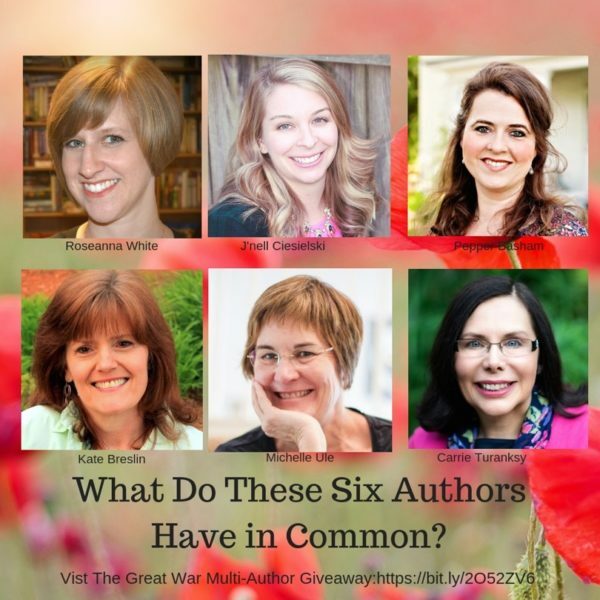 I hope you’ll get a chance to discover these other talented authors of WWI fiction! I love Kate Breslin’s books and would love to read more of her books and other authors in this genre. It is my favorite genre! Thank you, Heather! I wish you the very best in the contest! I haven’t read any of these books, but I have read some of the authors. Susan, thank you for your participation! Good luck on the contest! Hi Susan! Thank you for participating! I hope you’ll get the opportunity to read these titles! I have read Carrie’s books, but am excited to read the others! Melissa, I love Carrie’s novels! I hope you’ll enjoy discovering these new to you authors as well! I haven’t read any of these books, but they all look awesome! Hi Candi! I hope you’ll get the chance to enjoy reading these stories! I don’t believe I have read any but this is a great opportunity to read their works. Thank you, Lori! I hope you get to read the novels by these wonderful authors! Would love to have these. If we don’t have all of them in our church library (which I doubt) I would donate them. Otherwise they are mine. All mine. Ha! That’s great, Paula! Actually, if you’ve signed up for my newsletter, in December I’ll be hosting a contest giveaway that includes a free book for a US church library! We visited Vimy Ridge and Mauthausen concentration camp last year. It brings history alive to see it in person. I wish that every teenager would have the opportunity to visit a historical site like these as I think it could be life changing. Amen, Arletta! Our younger generations really have nothing to compare to what so many people suffered through in both world wars. Mallori, thanks for posting! I hope you get to read them, too! Good luck on the contest! Lual, we’re delighted to have you participate! I hope you get to read them all! Interesting era in New to these authors. Thanks for the chance.Here’s hoping. Good luck in the contest, Donamae! I hope you’ll the chance to read our stories! Love the novels wrapped in history! Thanks, Beth! I love weaving fiction into real history! I haven’t read any of these novels! Thank you for this giveaway! Jolene, thank you for participating! I hope you’ll get the chance to read these stories! It’s our pleasure, Holly! Good luck on the contest! I have read a few books by Roseanna White, but none by the other authors…yet. I will add them to my list!! 🙂 Thank you for this opportunity! I have read a few books by Roseanna White, but nothe any of the other authors…yet. I will add them to my list. Thank you for this opportunity!! Thank you, Becky! I hope you enjoy the stories by these new to you authors! I have read Among the Poppies and the rest of the books are on my tbr list. Thanks for the giveaway. Thank you for participating, Sandra!